Oaks are the biggest trees of the Bialowieza Forest although they are not as high as pines or spruces. They reach the largest sizes in moist forests bordering on riparian and alder forests. Some impressive specimen also occur in fresh forests. The Bialowieza oaks' sizes are determined by fertility of the local habitats and competition for light with other similar trees of different kinds. The result of this competition is that the most of forest oaks have completely different habit than representatives of the same spiecies growing in open area. Their trunks are not as thick but very soaring instead. Some of these oaks reach 6-7 meters in the trunk perimeter. The trunk's distance to the first branch is 18-20 meters, and the total trunk's height reaches even 30m. We can easily say that it is impossible to find such oaks in any other place in Europe. 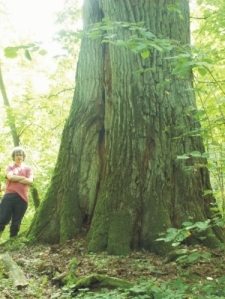 Therefore in order to emphasize uniqueness of these trees there has been introduced the term: 'CLASSICAL BIALOWIEZA OAK'. However to bear this proud name an oak must meet the following criteria: the trunk perimeter at the height of 130cm should be at least 550cm, the trunk's height to the first branch should be at least 15 meters, the total trunk's height should exceed 25 meters and the height of the tree should be at least 36 meters. Although in the forest there are thousands of oaks of monumental sizes only 10-20 meet these criteria. One of them(photo below) grows near so-called 'The Detour'. It is an oak with a beautiful, extremely soaring trunk and a very wide-spreading crown(which is unusual for the Bialowieza oaks). 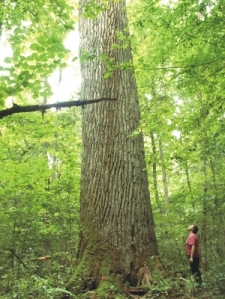 No matter of its size(perimeter 589cm with height about 41m)the longevity of this tree is very good. Especially its beautiful trunk impressively planted in the ground is worth admiring. On this account this oak outclasses even such legendary Bialowieza oaks as 'Jagiello oak' or 'Bartny oak'. As for 'Jagiello'- this oak, like scientist suppose, grew for some time in open area and because of that it couldn't reach too impresive slenderness of the trunk. But the crown's boughs were huge instead, much bigger than other Bialowieza oaks(one of them-'Odłamyn' was 29 meters high in the 50-ties). 'Bartny Oak' on the other hand has a very impressive trunk pillar but the straight line of the trunk ends at the height of the first boughs of the crown(16-17m). By the way it's worth mentioning about an oak growing in the natural reserve 'Łagiera', which unfortunately withered a few years ago. It was the oak which from the very beginning had grown in a clearing that used to be there. Therefore its habit is significantly different from other forest oaks. 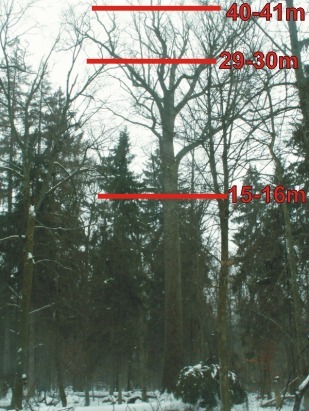 It is relatively low(30m)-which is unusual for Bialowieza conditions, but it has a substantial trunk's perimeter(625cm). According to specialist literature the maximum sizes of forest oaks are: height-41-43 meters, trunk perimeter-700-750cm, maximum age-500-600 years. Measurements taken by me confirm the information concerning height & perimeter. The matter of age still remains disputable.